As the requirement for targeted solutions for chronic diseases continues to grow, the interest of pharmaceutical and biotech companies has increasingly focused towards RNA therapeutics, such that by 2020, the RNA Therapeutics Market is predicted to attain $1.2 billion. 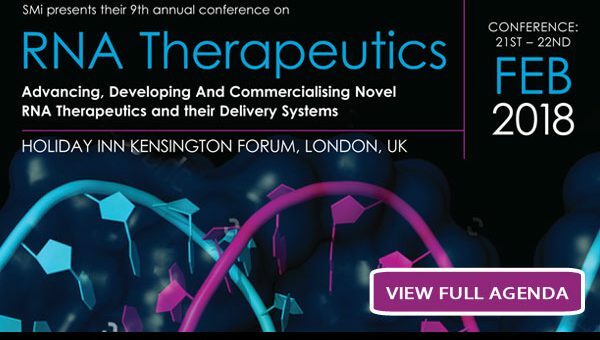 One of the main challenges in RNA Therapeutics continues to be bridging the gap between in-vivo and in-vitro models, hear key case studies on the development on the latest delivery systems and evaluate with key industry leaders the lessons they’ve learnt whilst developing an RNA therapeutic. 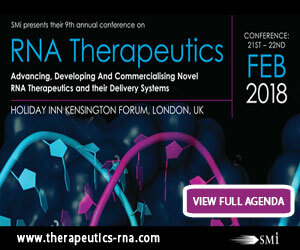 Join us this February 2018, as SMi’s RNA Therapeutics Conference brings together industry experts from leading RNA therapeutics companies to analyze and evaluate the latest advancements including SaRNA as a potential therapeutic for people with liver cancer, advances in targeted delivery of nucleotides beyond the liver and the latest developments in delivery systems, such as exosomes and nanocomplexes.